Tulingan or Skipjack Tuna is commonly found in wet market in the Philippines. So I think it will not be hard for you to find this main ingredient of this dish. 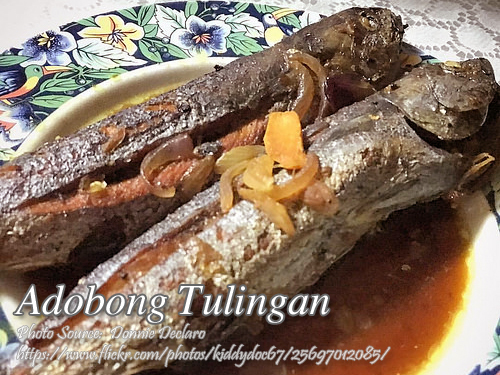 The only thing about tulingan is the very fishy taste and smell so not many people are fond of eating tulingan. The fish meat is also very dense, dry and tough if you cook it well done. You also have to know how to clean this fish not only removing the gills and innards but also the glands at the base if the tail which have toxins. You can also use other varieties of tuna like the yellow fin tuna or mackerel tuna to cook this dish if tulingan is hard to find in your area. To cook adobong tulingan: Coat pieces of skipjack Tuna with rock salt or table salt and fry until golden brown. In another pan, saute garlic, onion and ginger. Then add soy sauce, vinegar, laurel leaves, brown sugar and pepper. Simmer for a few minutes then put the fried tulingan. Coat the fried fish with the sauce to make a flavorful dish. To see the rest of the recipe with the exact measurement of ingredients, continue reading. Coat pieces of skipjack Tuna with rock salt or table salt and fry until golden brown. In another pan, saute garlic, onion and ginger. Then add soy sauce, vinegar, laurel leaves, brown sugar and pepper. Simmer for a few minutes then put the fried tulingan. Coat the fried fish with the sauce to make a flavorful dish. Hi Mae, are you sure it’s a tambakol? how did you know? i agree it’s a tambakol not a tulingan, a tambakol is flat shaped when sliced. a tulingan acquires the shape of dalagang bukid fish but more stuffed. it’s a nice dish. 🙂 God bless! Hi CJ and Mae, I changed the photo. I hope this adobong tulingan looks alright to you.